The morning run up Knight Inlet on the grizzly bear tour is always interesting. It is a spectral view, Grizzly Bear Lodge is located approximately 20 miles from the mouth, and the grizzly viewing area starts another 25 miles up the inlet, which is about 90 miles long. Eagles are abundant on the morning run this one being in the Glendale estuary the primary grizzly bear viewing area. Eagles are not always in trees it is not uncommon to watch them pick up a fish from the water and then land on shore to eat the “catch of the day”. 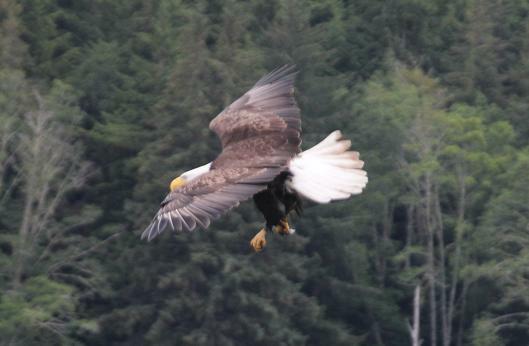 This bald eagle with talons open was coming in to catch a late breakfast. Every tour from the lodge involves wildlife viewing in this case a rather large black bear. This viewing was on a morning grizzly bear trip up Knight Inlet. We leave the lodge about eight o’clock and it takes a little over an hour to reach the grizzly watching area but along the way we frequently see black bears. This one enjoying breakfast on the beach, turning over rocks, eating barnacles or muscles, small crabs or anything that moves, as well as seaweed. 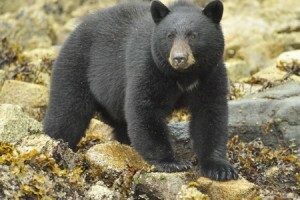 This is a good-sized bear and notice the white patch on the chest it is common. “OK so we can’t all be grizzlies!” was Harold Bailey’s comment for the photo he provided from his UK was the first week of September.